Image by Franck Guicquaid, Eurocat 2011. The F18 Class has many big events, but the Eurocat is always the first of the season and part of the Grand Slams of the IF18CA. Where all new designs and teams are tested looking towards each annual Worlds, that this year will be held in Ireland , check 2014.f18worlds.com for details. 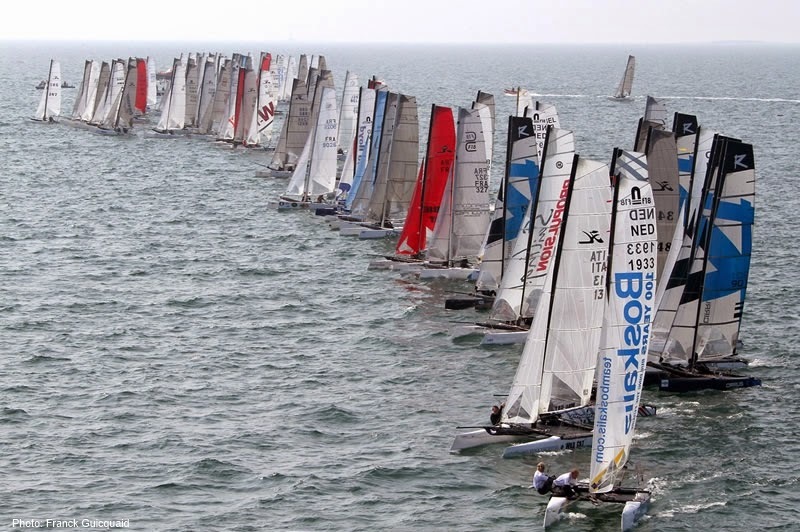 The Eurocat also has C1, C3 & C4 Classes where F16s, Tornados, and other 20 footers like M20s, Nacra F20c participate together in the Long Distance event. This year the FPhantom will be there too to aim for the Raid crown. Last year we didn´t had many pics from the org but I might be reporting live this year for the first time, so I will try to get some good ones. Such events must have a Pro taking images though.